If you do any amount of cabling in commercial buildings, you can’t avoid pulling cables through masonry applications. Typically you will need to drill anywhere from a 1″ to 4″ hole to accept a sleeve of some kind be it a piece of EMT conduit or a pass through device. You have several choices. Number one, you can hire someone to core the holes for you. If there is another trade already coring through the wall, cost may not be so bad. If you have to hire a coring contractor, it can get expensive. There are times when hiring someone is the best way to go. If you have a lot of holes, bigger holes or you have post stressed concrete, you may be better off passing the liability and cost to a concrete cutting coring firm. Choice number two involves poking a bunch of smaller holes with a hammer drill and then breaking out the center. There are times where this may get you buy, but consider an easier option first. SDS core bits. Most contractors today utilize SDS hammer drills. These hammers can also perform coring jobs quite well. A standard SDS hammer like a Hilti TE15 or Bosch 11255 hammer should be able to 2-1/2″ core with relative ease. The core bits used for these types of hammers are carbide tipped and have a thin wall. This thin creates less resistance than what you may find on bigger core bits making for an easy drill. Check out the video, you will be impressed on the speed! Click here to find Bosch Speed Core SDS Thin Wall core system. How do you suspend grid wire or all thread from a concrete deck while standing on the floor if the the concrete is to brittle for your Ramset or Hilti tool or you simply are not allowed to shoot. For those times when you need to suspend a cable run or anything for that matter to a concrete deck that is just out of reach, consider the ODM overhead drill machine. Designed to work with most D handle SDS rotary hammers, the ODM overhead drill machine extends to reach ceilings decks up to 13′. The hands free probe trigger system allows you to keep both hands on the tool. After you drill your hole, use the I Driver to drive in tie wire wedges or spikes with ceiling grid wire pre attached. 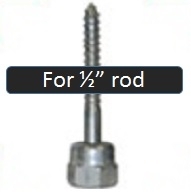 If you want to install threaded rod, simply drill the hole and then install a concrete Sammy Screw, with the threaded rod already attached using the Torque Master tool. Think of the time savings over a lift that can be had in many situations. Click here to see a video of the tool in use. If you are faced with the challenge of drilling an extra deep or long hole in masonry, you know it can be a real challenge to find a hammer drill bit long enough for your SDS hammer drill. Usually you can find a bit that will drill up to about a foot, but some projects, especially projects that are older buildings or additions will require you to drill deeper holes. Now what? Be prepared. We offer a full line of SDS bits from 3/8″ to 3/4″ diameters that will give you a drill depth of anywhere from 16″ to 34“! If you need a whole a little wider, you can drill a pilot with the smaller diameter and then come from either side if possible. We have bits 7/8″ diameter to 1-1/4″ that have 16″ diameters. If you have an application that requires a larger hole, consider one of our thin wall cores designed for use with SDS hammers. You will find a size range of 1-9/16″ to over 4”. There thin wall design reduces the amount of friction allowing even small to medium size SDS hammers to handle up to 2-1/2″ hole or more with ease. Click here for extra length SDS bits. Is my hammer an SDS hammer? Sometimes we get the question, especially with Hilti hammers, is my hammer an SDS hammer drill? If it is a smaller hammer, likely so. It can get confusing, with some brands. For instance, Hilti calls the bits for SDS hammers a TE-CX bit. An SDS shank hammer drill bit is about 3/8″ diamter and has to dimples opposite each other, and two slots opposite each other. If that is what you have, any SDS bit will fit in to your hammer drill. If the shank is about 3/4″ you likely have an SDS Max or possibly a spline bit. These are typically bigger, and noticeably heavier tools.